[GURPS] February 22, 2019: An Instant Car Wars Collection, Now On Kickstarter! Thread: February 22, 2019: An Instant Car Wars Collection, Now On Kickstarter! Our Pocket Box campaign*on Kickstarter closes*one week from today, and it has turned into an incredible deal for Car Wars fans looking to replace forgotten, lost, and worn titles from the game's earliest days. At this point, the campaign's $200 reward level includes three Car Wars plastic Pocket Boxes, three booklets, six ziplock-bag expansions, as well as three 9-inch by 12-inch pocket folders (perfect for carrying your game notes, vehicle designs, and any FAQ or articles you may print from the web). Two Car Wars storage-box stickers &ndash;*included inside the Car Wars and Truck Stop Pocket Boxes &ndash; round out the selection; add two empty boxes to your pledge and BAM!, instant Car Wars storage boxes that fit perfectly with the other Pocket Boxes. Of course, all of these items are available as add-ons, so if you only need to replace one or two of the older expansions, you have the option to pick-n-choose what you want in your rewards package. 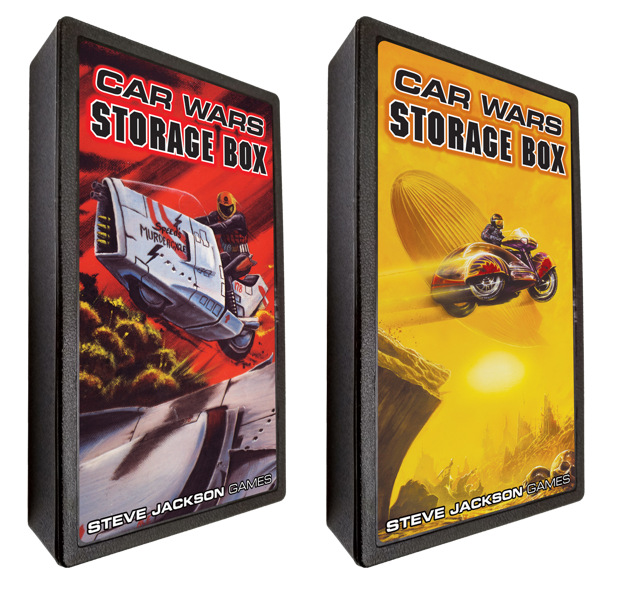 That big $200 Car Wars reward level is absolutely the project's best deal, though, so be sure to check it out and don't miss out on this chance*to bring back over 20 classic Steve Jackson Games titles. As mentioned recently, we're not sure which &ndash; if any! &ndash; of these items will be in stores, so the Kickstarter campaign is your best chance to guarantee that you'll get everything you want from the project. Thanks for the support, gang! This project has turned into an amazing event*and we're looking forward to seeing how much more can be unlocked before March 1st. Now wizards can hold their own on the field of battle, thanks to GURPS Magic: Artillery Spells. Turn the tide with a Withering Wail or let loose a toxic Cloud of Doom. Use one of the 50 new included spells, or devise your own. Upgrading your arsenal is just a download away, thanks to Warehouse 23!